A new insect threat has been identified that poses potential disease contamination problems for greater New York City and northern New Jersey hospitals, nursing homes and other medical facilities, the National Pest Management Association warned recently. New German research has identified moth flies as a possible mechanical vector for bacterial pathogens linked to nosocomial infections. In plain language, moth flies may transmit harmful bacteria between patients in hospital and other communal medical environments. Also known as drain flies, filter flies and sewage flies, moth flies are a common structural pest with a worldwide range. Commonly found flying around drain pipes, garbage containers and sewage disposal sites, these flies breed and develop in the gelatinous scum of decaying organic matter that lines drain and sewage pipes. To determine whether moth flies could transmit and spread disease, two German scientists collected moth fly specimens from four hospitals infested by the insect. In the exoskeletons of the collected specimens, they were able to identify 45 different species of bacteria from 40 genera, including one drug-resistant strain of bacteria. Study results were published in the Journal of Hospital Infection earlier this year. The discovery of a new vector for bacterial disease points out the importance of practicing good sanitary procedures in hospitals and other patient-care facilities, as well as the need for expert commercial pest control and pest management services in these facilities. Bees are distant relatives of hornets and wasps. While both have stingers, which will carry a painful sting as well as an allergic reaction in many people, there are many differences between the types of flying insects. Honey bees are known for their docile behavior. They will sting, but only when they feel threatened. Unlike wasps and hornets, the honey bee dies after it stings its victim. Honey bees are also known to swarm, usually during the spring, which can cause quite a panic for New Jersey residents report New Jersey pest control professionals. Honey bees are a protected species of bees within New Jersey. It is illegal to kill or harm honeybees, but they can be relocated to new areas with the help of a local bee keeper. NBC New York reported on March 18, 2018 that over 2000 honey bees had swarmed from their colony to form another colony. The worker bees followed the new queen to an Arlington, Texas home where the honey bees took refuge upon a mailbox as worker bees sought out a new location for the bee colony to exist. The homeowners report that it took several hours for the bees to arrive. A bee keeper agreed to come and collect the bees to add to her personal hive. New Jersey residents are reminded that while honey bees are considered to be docile bees, yellow jacket wasps are not. Honey bees are the only type of bees that will swarm in New Jersey. Yellow jackets are considered to be an aggressive species of bee that are known for their tendency to sting without cause. Most yellow jacket nests are found in the ground, but some paper like nests are found hanging from trees, bushes, or the edges of a structure. Yellow jackets are a dangerous species of insect to deal with which requires the help of a licensed NJ pest control professional like Stern Environmental Group. As springtime approaches New Jersey residents must keep in mind that as the weather becomes warm, many outdoor pests will rise to the surface or hatch from new eggs that are laid. Spring is a time of rebirth for flowers, grass, leaves, and all types of insects report NJ pest control professionals. One type of animal that won’t initially be considered a pest, but will eventually end up being a pest, is the yellow jacket. A yellow jacket nest begins when one single female emerges from her overwintering hide-a-way. Initially she will spend her time feasting upon nectar and insect prey. Once her ovaries become enlarged she will then search for a suitable place underground or up in a tree to begin to build her nest. Once her nest is built she will lay her eggs. The workers that emerge from the eggs will soon continue to build on to the nest and forage for food while the queen continues to lay eggs. There are different species of yellow jackets in New Jersey. The species which only feed upon live prey are not considered to be pests unless they reside too close to humans. Pest yellow jackets are the ones that feed upon human food sources. You will find pest yellow jackets at parks, ball fields, amusement parks, picnics, backyard barbeques, or any other place where people gather outdoors to consume food. As the summer months move one, yellow jacket nests become more populated, which means that there is less food availability for all colonies. The lack of food availability is one of the reasons why yellow jackets become so aggressive. For a yellow jacket, a human biting into a burger or piece of watermelon is considered to be an aggressive move and worthy of a sting from its backside! For those that are allergic to bees, yellow jacket stings are extremely dangerous and will result in emergency room visits. Businesses should hire an experienced NJ pest control professional to eliminate any yellow jacket nest as soon as it is noticed. Is Pesticide Exposure Bad For Children? The December 2012 print issue of PEDIATRICS Journal will contain the posted policy statement that has been issued by the American Academy of Pediatrics (AAP) regarding the health effects that children face when they are exposed to pesticides. According to PCT on December 5, 2012, the American Academy of Pediatrics states that “children who are exposed to pesticides (a collective term for chemicals intended to kill unwanted insects, plants, molds and rodents) every day have unique susceptibilities to their potential toxicity.” The concern is that children will face immediate and long term health problems because of the early life exposures to pesticides. Medical issues that children face are pediatric cancer, behavioral problems, and decreased cognitive function. • Protection against spray drifts and unintentional ingestions and inhalations for teen agricultural workers. • Improved physician training and diagnostic testing to determine when pesticide exposure is present or when it has caused an acute illness. • Change EPA labels on pesticides so that they are reflected in other languages, not only in English. • Change EPA labels so that all ingredients of the pesticides are shown. • States the importance of education, monitoring, and enforcement of using only legal pesticides. • Urges pediatricians to become more knowledgeable about pesticide poisoning. For the safety and well-being of your family and home it is always best to hire a licensed NJ pest control professional to apply pesticides for insects and rodent infestations. While there are many do-it-yourself products on the market that consumers can buy, they still carry serious consequences when they are not applied correctly to the home. In many cases, homeowners are unhappy with the results of the store bought pesticides and will apply additional chemicals to try to eliminate the home invaders. This practice can be extremely dangerous to children, adults, and pets. The licensed NJ pest control professional has the expertise to know the exact amount of pesticide to use and the correct pesticide to use. Anyone who has ever dealt with cockroaches in the home or business knows that they are the most difficult pest to live with and fully eradicate. Cockroaches have an amazing ability to escape death, even when it comes from the bottom of a shoe! Because of their stealthy speed, cockroaches are able to zip away in a blink of an eye. Because of their slim stature, cockroaches are able to slip into tiny cracks or crevices to escape death. 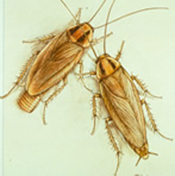 Studies have shown that even some pesticides are no match for cockroaches. Many have discovered that when they set off a store bought bug bomb, cockroaches will simply hold their breath and zip off to an area where the air is free and clear of the pesticide. They are considered to be a super-bug…or are they? “Mythbusters” ran experiments on cockroaches to see if these hearty creatures are able to be drowned as many people believe that it is an impossible feat to accomplish. Five individual cockroaches were placed in jars that were filled with water. The cockroaches were due to be underwater for 30 minutes. Nineteen minutes into the experiment, it appeared that one cockroach had indeed succumbed to the watery death. At the 30 minute mark, it appeared that all cockroaches were indeed dead as they were completely lifeless and waterlogged. The Mythbusters team covered each roach with their once water filled container and returned the next day. To their surprise, all five of the cockroaches were alive upon their return. Watch the attached cockroach video, it truly is amazing! It is unbelievable to think that these pests appeared to be dead, only to somehow dry out and awake the following day ready to face the world once again. Perhaps they are the stealthiest bug in the world.